The 3DS (and its predecessor the DS) has had an abundance of great puzzlers, and one of the first things you’ll notice with Tappingo is that it’s obviously well versed on its rivals. 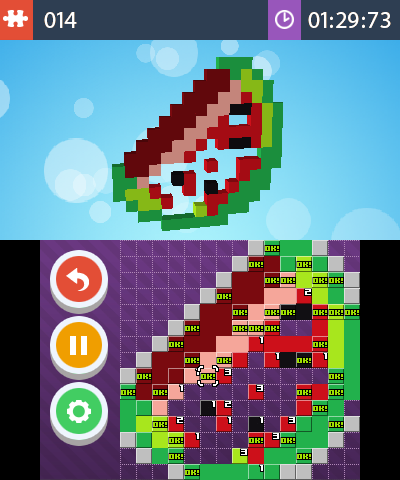 It looks very similar to Picross, and whilst the gameplay isn’t quite the same, it’d be hard to review Tappingo without drawing on the similarities between the two. 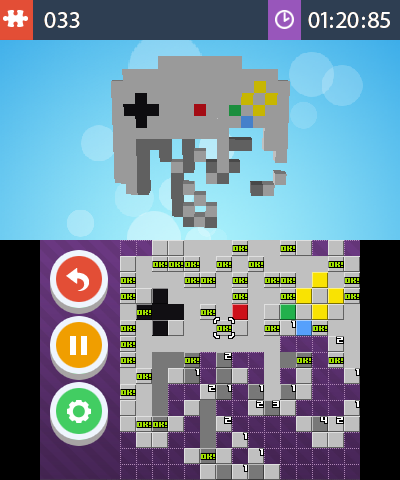 The grid-based block filling, the pixelated puzzles, the same nauseating mistakes that see you retrace half the puzzle so you can rewrite your errors; it’s all here, so is Tappingo just another clone, or does it do anything to set it apart from its well established, popular counterpart? If you’re an established puzzler, you’ll grasp Tappingo’s gameplay instantly, but for newcomers and veterans alike, you’re first greeted with an easy to follow tutorial that sets out the games rules. The premise is simple; you extend coloured blocks within a grid, with the overall aim of filling all the empty spaces and completing a picture. Each block has a set number in which it can be moved, so if you move a block too much, it will keep going until it hits another block, or if you don’t move it enough the original block will flash until you work out where you’ve gone wrong. Moving blocks is easily completed with a flick of your stylus or by using the D-Pad and the A button, but the touch method is the far superior way of controlling play. There’s a lot of forward thinking to be done, and simply guessing if a certain coloured block needs to be moved first can spell disaster to the overall puzzle and almost always ends in backtracking to fix mistakes, so planning ahead is a must. You can retrace your steps if you need to, or if your mistakes have gone too far you can simply restart a level and give it another go. Early levels are smaller with few moves to make and shorter journeys for your blocks to complete, but the second half of the game opens up much larger grids that require more work to complete. Even though the later levels are bigger, for the most part the game is without challenge, and as long as you forward think each grid, you’ll walk through most of the puzzles without a problem. The gameplay never strays from its roots, nor are you introduced to new methods or new challenges, just new puzzles with different pictures to complete. The only incentive to replay Tappingo is to see if you can beat any of your previous completion times, but the easy puzzles will leave you with little encouragement to speed run through early victories. Tappingo looks like how you’d expect it to; bright, primary colours and cute pixelated puzzles of everything from household objects to animals, sound tracked by generic puzzle music which you’ll leave off almost all the time, but its aesthetics do the job and overall it’s not displeasing to look at. Once you get through the initial levels and get used to the gameplay, casual and experienced puzzlers alike will blast through Tappingo. It doesn’t offer much challenge, and even with a generous 104 puzzles to complete it won’t take you too long to get through the entire game; even the last few grids only took around 10 minutes each to complete. 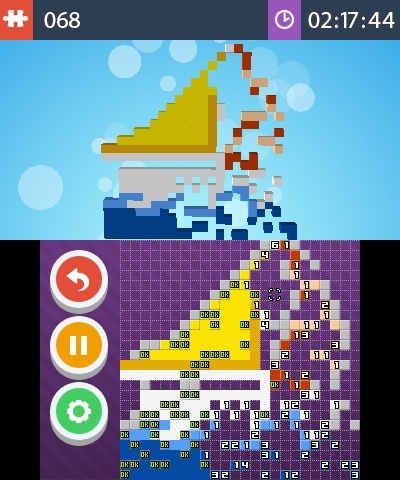 For the price tag Tappingo is worth a punt if you’ve completed the likes of Picross and other higher tier puzzle titles, but for newcomers who want an engaging and challenging puzzler, you can do much better elsewhere.